Vietnamese track and field athlete, Le Tu Chinh, has confirmed herself as the new “queen” of short distances in Southeast Asia by claiming the women’s 200m sprint title at the 29th SEA Games, on August 23. Le Tu Chinh wins both the 100m and 200m sprint in Malaysia. Just one day after being crowned the 100m dash champion, Chinh brought home another short-distance gold medal in the sport, completing the 200m race in a time of 23.22 seconds. Vietnam used to dominate Southeast Asia’s sprint events for a long period of time, thanks to the talent, tenacity and efforts of veteran athlete Vu Thi Huong, who has now retired and moved to live in Australia. Therefore, Chinh’s emergence is expected to help Vietnam consolidate its leading position in the region in these two disciplines. 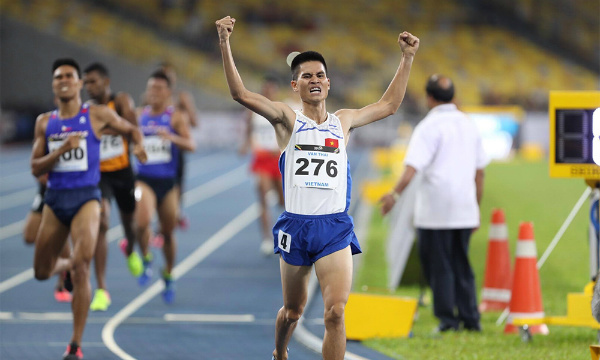 Apart from Chinh’s brilliance, Vietnamese track and field athletes secured a double win in the 800m race, as Vu Thi Ly and Duong Van Thai were crowned the women’s and men’s champions, with respective times of 2:07.12 and 1:48.97. Duong Van Thai finishes supreme in the men's 800m event. Concluding the fourth official day of competition, the Vietnam sport delegation won 12 additional gold medals (four in athletics, three in gymnastics, two in karate, and one each in cycling, fencing and shooting), increasing their provisional gold medal haul in Kuala Lumpur to 28. Vietnamese athletes also brought home eight more silver medals, including two in gymnastics, karate, swimming and track and field, in addition to two bronze medals in karate and fencing.